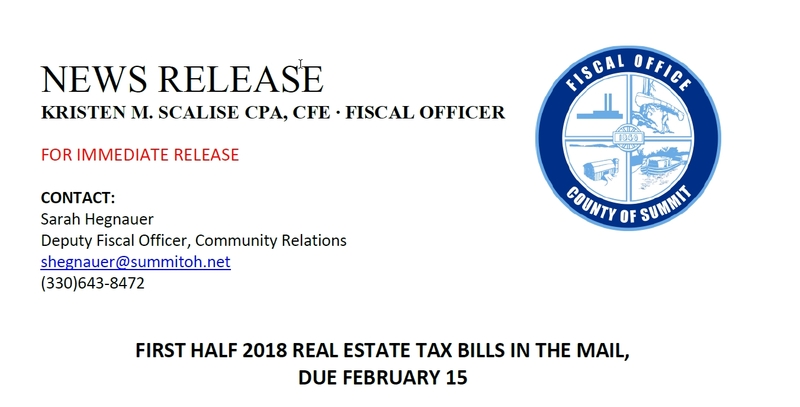 Akron, Ohio, February 11, 2019 – Summit County Fiscal Officer Kristen M. Scalise CPA, CFE would like to remind property owners that first half 2018 real estate taxes are due on Friday, February 15, 2019, with the exception of military personnel. Property taxes are deferred for military reservists who are on active duty. Applications can be obtained by calling (330)643-2641 or visiting our website at http://fiscaloffice.summitoh.net. 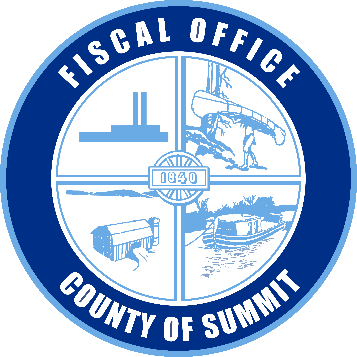 In person: Payments can be made in person at the Summit County Fiscal Office, Treasurer Division, 3rd floor of the Ohio Building, 175 S. Main St., Akron 44308. Office hours are 7:30am-4:00pm, Monday through Friday. By mail: Mailed payments must be U.S. postmarked by Friday, February 15, 2019 to avoid the statutory 10% penalty for late payment. A private meter is not valid for establishing the date of payment. Online or by phone: Tax bills can be paid online or by phone through a secure payment service provided by Official Payments Corporation. Taxpayers will need their parcel number on-hand. A nominal service fee will be charged by Official Payments Corporation. To pay taxes online or by phone, go to http://fiscaloffice.summitoh.net/index.php/on-line-tax-payments. The Tax Installment Program (TIP) will be available again this year. Homeowners who pay their real estate taxes directly to the Fiscal Office, but cannot pay the full first half amount due, can avoid late payment penalties by enrolling in the TIP. To be eligible, all taxes and assessments must be current. The deadline to sign up is Friday, February 15, 2019, also the last day to pay first half 2018 real estate taxes. Call 330-643-2869 for more information. We remind taxpayers that Ohio law states it is their responsibility to obtain and pay their tax bill on time. To get a copy of your tax bill, please call 330-643-2588 or use our toll-free number at 1-888-388-5613. Tax bills can also be downloaded from our website at http://FiscalOffice.summitoh.net. Click on the “Property” box in the top menu, search for your property and then click on the link in the left side menu titled “Tax Bill (PDF)”.